Home > Articles > 637 > Would Low Tunnels Provide New Opportunities for Strawberry Production in Indiana? Strawberry production in Indiana primarily utilizes matted row systems, in which bare root strawberry plants are set in the spring, fruit is first harvested in the second year and plants are maintained for a few seasons. Strawberry production using an annual plasticultural system is popular in the southern states, at where strawberry is planted in the fall and harvested in the next spring. In the annual plasticultural system, strawberries have a longer harvest period and produce fruit with better quality. Growing strawberries as an annual crop is a challenge in Indiana. This is because our short fall makes it difficult for plants to reach the desirable sizes that lead to a sufficient yield in the following spring. This impression can be changed with the use of high tunnels that provide additional heat units and moderate frost protection. In a trial conducted in a 30 ×96 high tunnel at the Southwest Purdue Ag Center, strawberries were planted in Sep. 2015. The majority of strawberries were harvested in April and May 2016. A total yield of 1,295 lbs of strawberries were harvested from the 0.07 acre area. The yield is very promising. However, we realize that spacing in high tunnel is extremely valuable. We should consider high tunnel returns on a per square foot, and a per month basis. In this regard, strawberries that grow in soil and take eight months from planting to harvesting may not be the top crop to achieve the best returns. If a grower only has one or two four-season high tunnels, strawberry is not the top choice of crops growing in the high tunnels. 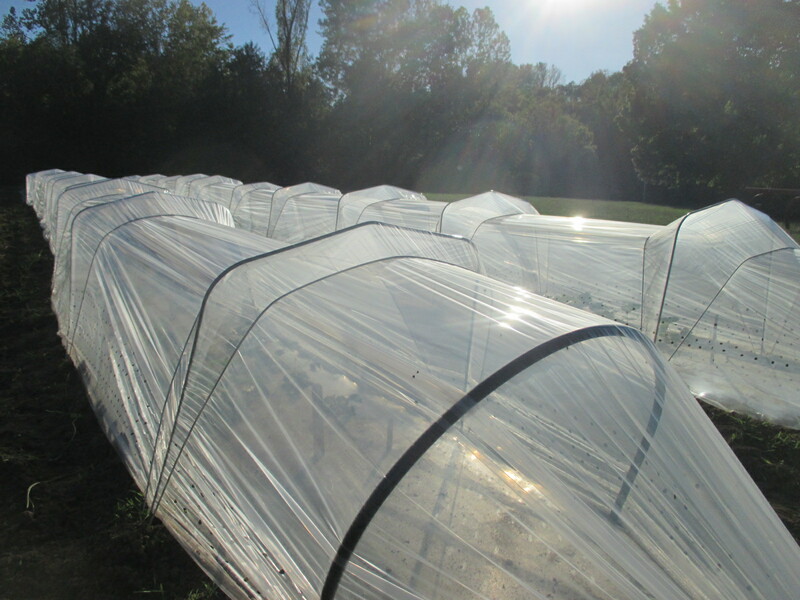 Considering these limitations, we initiated a project to evaluate retractable low tunnel system to grow strawberries. This system requires initial investment about 1/3 of the cost of a high tunnel. We planted strawberries on Sep. 13. Low tunnel was set up on Oct. 6. Eight varieties were grown side-by-side under low tunnels and open field (Figure 1.). 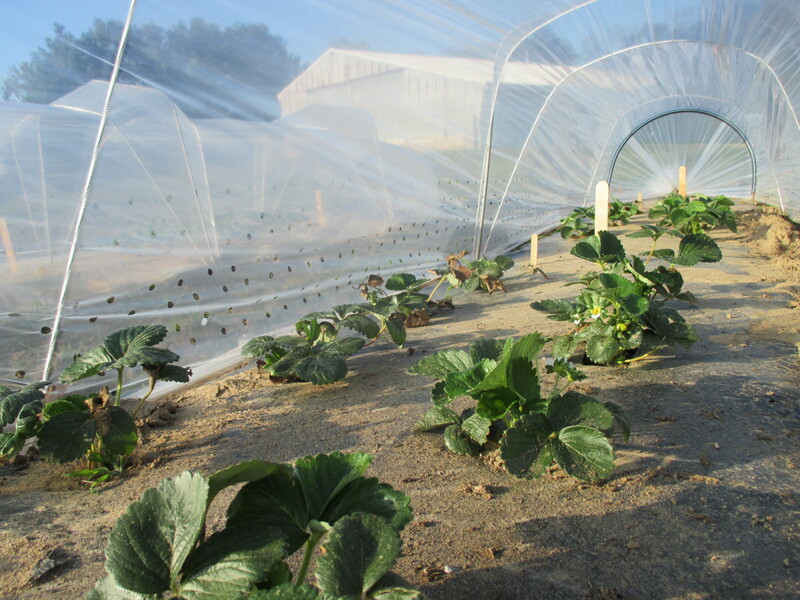 In this trial, we are going to compare effects of the heat accumulation under low tunnels as compared with open-field to strawberry growth and yield. We will also compare effects of frost protection of traditional straw mulch with fabric row covers in the winter. Update about the trials will be published on Facts for Fancy Fruit and Vegetable Crops Hotline newsletters. Please follow us to learn more about using the low-tunnel system to grow strawberries in Indiana. Figure 1A. Strawberries grown under retractable low tunnels. Figure 1B. Strawberries grown under retractable low tunnels.